1. Wake the device up by attaching it to the charger (no button necessary), the device will vibrate and flash green when charging. To confirm your UV sun monitor is paired to your app, refer to the pairing icon in the top right of your dashboard. You may also double-tap the UV sun monitor on the logo. If the LED is green, you are paired. If the LED is blue, you are not paired. Before you begin using your Eclipse Rx UV sun monitor, you must connect it to your Eclipse Rx account with a phone or tablet. Connecting your device allows it to sync data back and forth with sun monitor. Your data syncs to your EclipseRx dashboard, which is where you can see your daily exposure, track your steps, log sunscreen applications, and more. While creating an Eclipse Rx account you’ll be asked for personal information such as age, and gender. 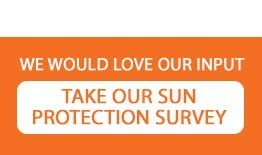 We use your answers for various calculations, such as your personalized total UV exposure percentage. 1. Make sure the Eclipse Rx app is compatible with your phone or tablet by checking here. • The Apple App Store for iOS devices such as an iPhone or iPad. 4. When the app is installed, open it and tap Sign Up to create your Eclipse Rx account. 5. Once your account is setup, follow the onscreen instructions to select your skin type. 6. Once you’ve selected your skin type, continue following the onscreen instructions to pair your Eclipse Rx to your phone or tablet. Pairing ensures the UV sun monitor and device can communicate with one another. 7. You will be prompted to turn on notifications – Notifications will tell you when you need to take an action. We’ll let you know when you’re getting too much sun exposure, when you need to apply or reapply sunscreen, and when you have reached your maximum sun exposure for the day. Your Eclipse Rx UV sun monitor will regularly sync with your dashboard. The dashboard is where you’ll track your UV exposure and your steps. The Eclipse Rx uses Bluetooth Low Energy (BLE) technology to sync your UV sun monitor to your phone or tablet. Each time you open the Eclipse Rx app, it syncs automatically if the paired UV sun monitor is nearby. To confirm your UV sun monitor is paired to your app, refer to the pairing icon on the left of your dashboard. You may also tap the UV sun monitor on the logo. If the device flashes green, you are paired. If the device flashes blue, you are not paired. EclipseRx allows you to create a personal sun profile including details such as your skin type, what type of sunscreen SPF you use, how often you use it, and more! During your initial account setup, you will be asked to determine your skin type. Eclipse Rx uses the Fitzpatrick phototyping scale to estimate the response of different types of skin to ultraviolet (UV) light. The Eclipse Rx UV sun monitor tracks your sunscreen applications. After two hours, the device will notify you to reapply sunscreen. 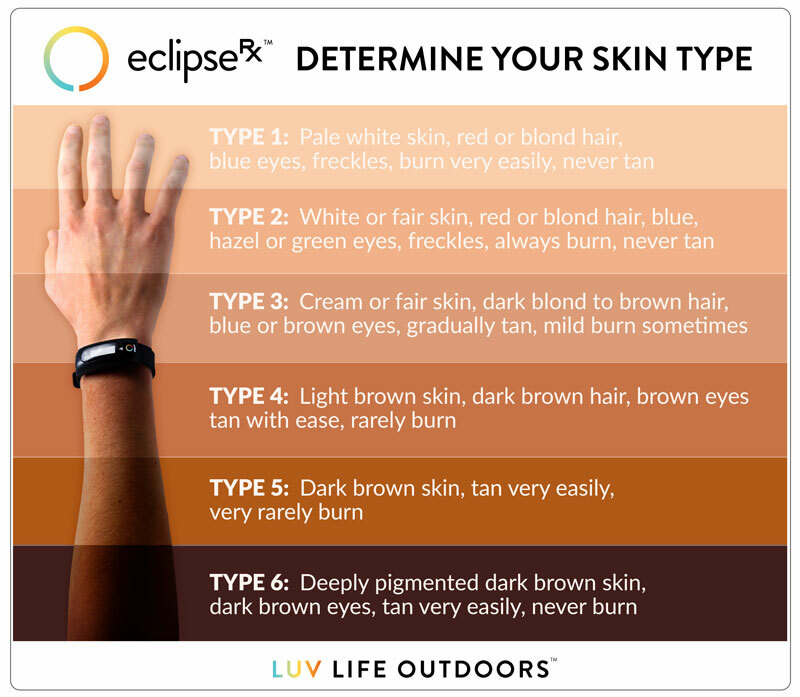 The Eclipse Rx will track your daily hours of UV exposure, and your personalized UV exposure percentage, based on your skin type, sunscreen applications, and your real-time UV exposure. Your exposure percentage will increase throughout the day. This section tells you how best to navigate and recharge your UV sun monitor. EclipseRX is dedicated to helping you make smart sun-safe decisions by alerting you through push notifications, gentle vibrations and indicator lights. EclipseRx UV sun monitor will regularly sync with your dashboard. To confirm your UV sun monitor is paired to your app, refer to the pairing icon on the left of your dashboard. You may also tap the UV sun monitor on the logo. If the LED is green, you are paired. If the LED is blue, you are not paired. When the battery on the UV sun monitor is low, the device will double flash red every 5 seconds. When the UV sun monitor is fully charged, it will vibrate once, then flash green in a slow pattern. To reset the EclipseRx, locate the reset button on the bottom of the monitor. Use a sharp tip to hold down the reset button. Press until you feel the button click. If the device is off, pressing the reset button will turn the device on. You should feel a quick vibration. If the device is on, pressing the button will cause the green LED to flash. If the you continue to press and hold the button, the green LED will turn off. You must press the button again for the device to turn back on. The Eclipse Rx is a solar powered wearable - if you’re out in the sun, your device is charging! Your fully charged Eclipse Rx has a battery life of up to 7 days. Battery life and charge cycles vary with use and other factors; actual results will vary. A full charge takes approximately an hour and a half. 1. Plug the charging cable into the USB port on your computer or a UL-certified USB wall charger. 2. Attach the UV sun monitor to the charger by inserting the charger's pins into the holes on bottom of the UV sun monitor. You’ll know the connection is secure when the UV sun monitor vibrates, and you see the indicator lights blinking. It’s important to clean and dry your Eclipse Rx regularly. Always remember to keep it clean; keep it dry; don’t wear it too tight; and give your wrist a rest. Even though the Eclipse Rx is water resistant, it’s important to thoroughly dry your band and UV sun monitor and remove any debris from your device after wearing it in the water. To clean your Eclipse Rx, remove the UV sun monitor from the strap. Clean the UV sun monitor with a soft dry cloth or with a mild cleanser. Clean the strap with gentle soap and water and dry it thoroughly before reinserting it into the UV sun monitor. We occasionally make free feature enhancements and product improvements available through firmware updates. We recommend keeping your Eclipse Rx up to date. When a firmware update is available you’ll see a notification in the Eclipse Rx app prompting you to update. Note: Updating your Eclipse Rx takes several minutes and may be demanding on the battery. For this reason, we recommend updating while your UV sun monitor is fully charged or plugged into the charging cable. Your Eclipse Rx contains a 3-axis accelerometer, which tracks your motion patterns, a UVA and UVB sensor for tracking UV exposure, and an eSpectral sensor for tracking visible, ultraviolet, and infrared light. The wristband that comes with Eclips eRx is made of a flexible, durable silicone. It does not contain latex. The clasp is made of surgical-grade stainless steel. Eclipse Rx contains a Bluetooth Low Energy radio transceiver. Eclipse Rx contains a vibration motor, which allows the UV sun monitor to vibrate with alarms and notifications. Eclipse Rx contains a rechargeable lithium-polymer battery. The Eclipse Rx has an LED tap display. Operating Temperature 14° to 113° F (-10° to 45° C). Water Resistant up to 30ft. Warranty information and the fitbit.com return policy can be found here. • This device may not cause harmful interference, and distractions could be hazardous. Changes or modifications not expressly approved by Eclipse could void the user’s authority to operate the equipment. This device meets the FCC requirements for RF exposure in public or uncontrolled environments. CAUTION: This product is not a toy. Do not allow children or pets to play with your device. It includes small parts that can be choking hazards. CAUTION: This product is not a medical device, and is not intended to diagnose, treat, cure or prevent any disease. CAUTION: Consult your physician before beginning or modifying any exercise program. CAUTION: Consult your physician before use if you have any preexisting conditions that might be affected by your use of this device. CAUTION: This device may cause skin irritation. Prolonged contact may contribute to skin irritation or allergies in some users. If you experience any sign of skin redness or other skin irritation, please discontinue use. If symptoms persist, consult your physician. • Do not dispose of your device in a fire. They battery could explode. • The battery should only be charged with the included charging cable. Connect the charger to a USB port on your computer or a UL-certified USB wall charger. Do not wear the device while charging it. • Do not charge the device while it is wet. • Do not attempt to replace the battery or to open the enclosure or to disassemble your Eclipse Rx. Doing so will void the warranty and could result in a safety hazard. You must dispose of this product properly, according to local laws and regulations. Because this product contains electronic components and a battery, it must be disposed of separately from household waste. Contact local authorities to learn about disposal and recycling options. You can unsubscribe anytime, and we never share your information!